The 30 million word gap does not end after age three. It continues to widen for underserved students throughout their academic careers and lives. "The most accurate predictor of school success is the size of a child’s vocabulary at age five of 'book' words," according to a report by the Joan Ganz Cooney Center (Gee, 2008). These “book words” are the academic vocabulary learners need to know and understand to meet their potential in school and beyond. Children who do not hear English spoken at home or whose parents do not read to them, for example, rarely hear in English the words that matter in academics. Students whose parents have not attended college, or even high school, can also be at a disadvantage in school due to the lack of recognition of academic language. As former ESL, ELA, and STEM teachers (and former ELLs), Speak Agent team members have personally encountered tremendous variability in language background and level, home environment, and other factors, such as interrupted education, poverty, or undiagnosed special needs. We know that teachers face major challenges and a lack of resources as they try to support each learner. This is made more difficult by the vast disparity between underserved students and the general student population. 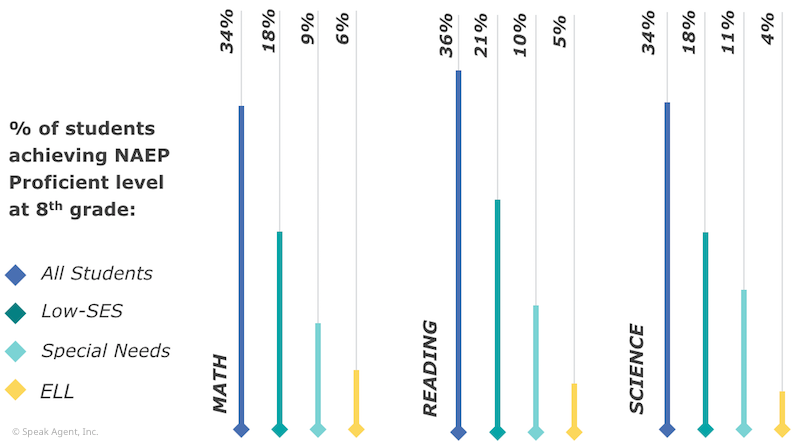 In fact, nearly two-thirds of all U.S. students fail to achieve Proficient level on the NAEP math, reading, and science tests at eighth grade. But the failure rate rises to four in five for low-income students, nine in 10 for students with diagnosed disabilities, and 19 in 20 for English language learners (ELLs). Why? Learner variability describes each student's unique set of abilities and experiences that impact her or his learning within an education model that was originally designed for standardized mass instruction. As our friends at R&D partner Digital Promise like to say, learner variability is now the rule, not the exception. The proportion of students with significant learning differences now likely exceeds 40% of all learners (Digital Promise, 2016). This growing population, which includes ELLs, students with disabilities, low-income students, and students with interrupted education and trauma, faces even greater barriers to acquiring the crucial "language of content" than the general student population does. Today these students are profoundly underserved. They need additional multisensory supports and engaging interactivity that make academic content more accessible, reduce cognitive load, develop confidence and self-reflection, foster a growth mindset, and facilitate effective learning strategies. Our mission is to ensure that each child, regardless of her or his learner variability, masters the academic language and concepts critical to success in school and careers. That's why we developed Speak Agent's unique Academic Language Learning (ALL) model to feature research-based supports and learning strategies for the full diversity of learners. We developed 33 specific types of evidence-based strategies and supports in collaboration with cognitive scientists and language acquisition experts at Digital Promise, WestEd, and Teachers College, Columbia University. Speak Agent is a unique solution that can align digital content to any curriculum, enable differentiated instruction, and personalize the learning experience. It also correlates to WIDA and other standards.